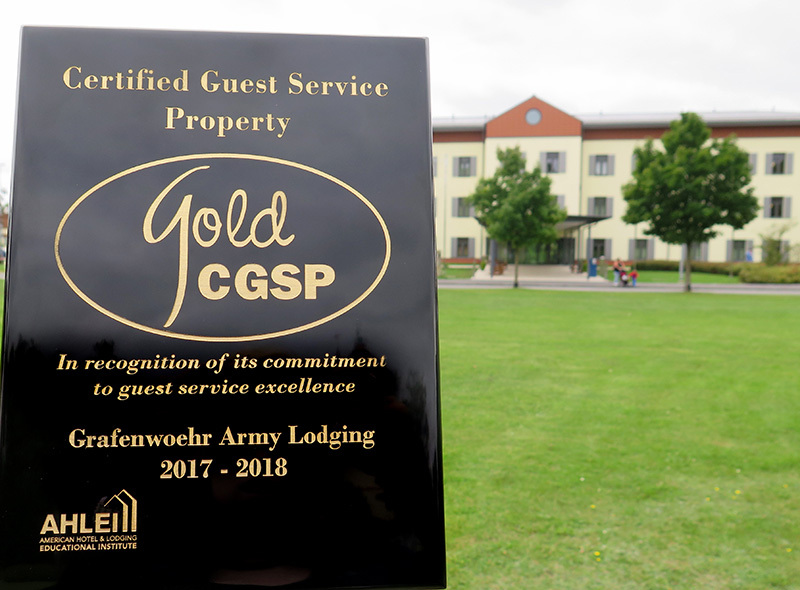 GRAFENWOEHR, Germany — The Army Lodge here at Tower Barracks recently earned high honors for providing exceptional guest services. The lodge was awarded Sept. 7 the Certified Guest Service Property award presented by the American Hotel & Lodging Educational Institute. The American Hotel & Lodging Educational Institute, or AHLEI, is a nonprofit organization that offers hospitality training and hotel management certifications across the globe. Receiving an award from the group is a mark of distinction within the hotel industry. The lodge staff on Tower Barracks are now recognized as a Certified Guest Service Professionals for the “know-how to provide excellent guest service and for their commitment to creating memorable guest experiences,” according to the award citation. Army Lodging staff earned prestige having studied, completed a course, and received a certificate and pin from the American Hotel & Lodging Educational Institute.